The following article, written by Senior Landscape Designer Carolina Carvajal, is part of an ongoing series that focuses on a select topic of inspiration for the month. The inspiration for May is “Focus”. 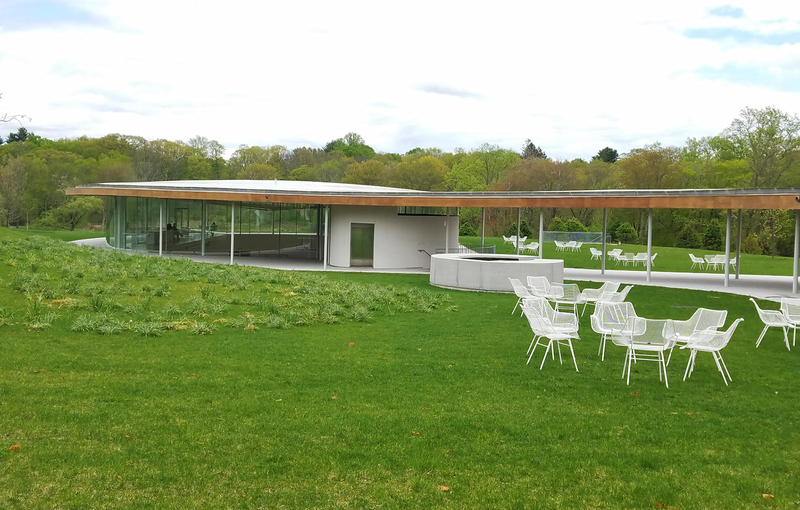 Carolina recently visited Grace Farms in New Canaan, CT and was so taken with the site and her experience that she decided to focus in on what makes a place like Grace Farms so memorable. A former horse farm, Grace Farms was transformed into a space that integrates nature, art, social justice, community, and faith. As a landscape architect, I am always enamored with a landscape’s ability to foster inspiring activities for its users. Aside from simply enjoying nature, the landscape at Grace Farms is the perfect setting for those expressing themselves through art; pursuing a better world through social justice; engaging with the community; or exploring faith. The landscape offers a restorative quality that I felt as immediately healing and calming. The landscape provides the canvas on which all of the positive activities at Grace Farms take shape. The architecture on site is complimentary to the natural curves and landforms in the landscape and allows its users to enjoy nature even while inside the building through floor to ceiling windows. Grace farms is currently retaining 77 of their 80 acres as untouched open meadows, woods, wetlands, and pond and the property currently has 35 trees that provide delicious fruits, like apples and plums. Once you arrive in your car, you will be greeted by a gatekeeper that will help you navigate through the most beautiful promenade of mature deciduous trees until you reach the main parking lot. 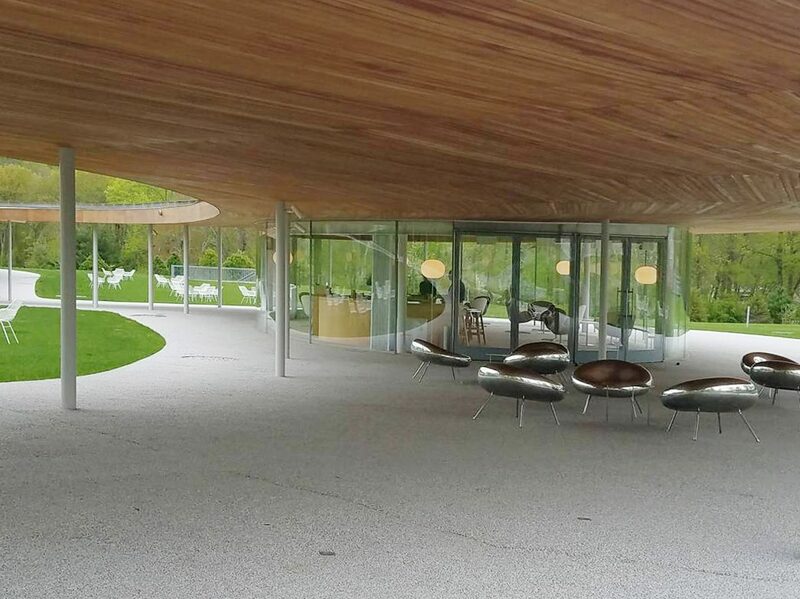 Grace Farms aims to allow nature to be present everywhere you look. The natural rolling hills, the smell of nature, flowers and fruit, and the sense of peace instantly comes in contact with you. Upon arriving I immediately calmed, and felt a sense of peacefulness and tranquility. There is a quote at Grace Farms that connected to the way I felt; “Nature’s peace will flow into you as sunshine flows into trees. The winds will blow their own freshness into you, and the storms their energy, while cares will drop off like autumn leaves.”- John Muir. Grace Farms continuously works on environmental sustainability through their operations and educational programs. Some of their programs include wildlife preservation, public garden, coastal and river cleanups, backyard explorer programs for children and adults. Grace farms will be a LEED certified project, for incorporating sustainable design that protects and restores habitat, maximize open space, incorporate sustainable practices for storm water, reduce water usage, and harness energy from geothermal wells. Just knowing that I was enjoying a site that protects and sustains the environment around it enhanced my enjoyment of the space. The river building snakes in the landscape as the dramatic sloped changes, almost as if the river building was perfectly carved into the landscape. Kazuyo Sejima, the co-principal of Sanna, the designers of the building, mentioned in an interview “it is clear that what they had in mind the whole time was a new kind of public space.” The primary concept was for the building to melt into the landscape. “When we said we want the building to disappear into nature, they lit up”. This statement is completely true and you can see it while approaching the building. Making it a mutual cohesive relationship environment between the building and the landscape. The large glass walls on the River Building allow for phenomenal views of the forest and meadows, and also allow nature to feel like is coming inside the building. The landscape is simple, yet natural and diverse. There are large areas of lawns and gardens for public gathering and play, meadows and wooded areas that allow for exploration and more private remote spaces. Another of their initiatives I fell in love with was the Grace Farms Arts Initiative. 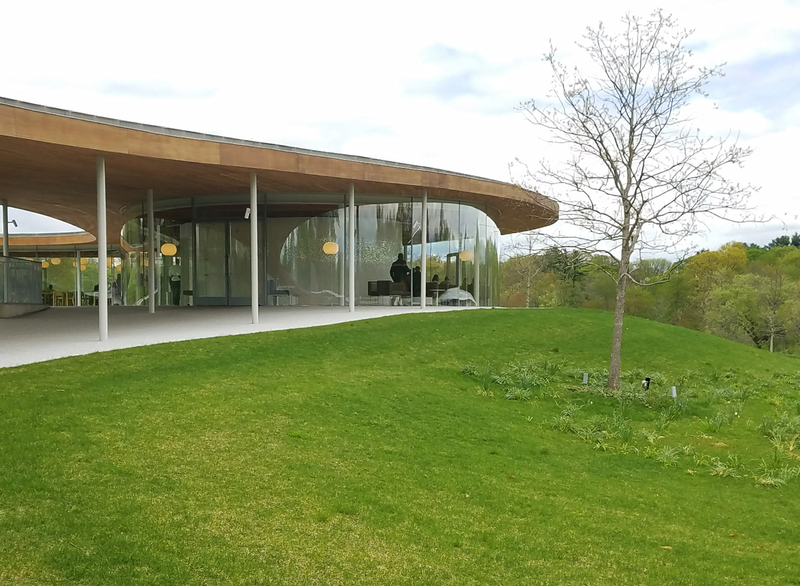 Grace Farms invites artists of different disciplines such as, visual, literary, and performing arts to share their art with visitors. This art initiative also includes temporary landscape exhibitions. Also every Saturday in the mornings they have a dedicated art program for children to enjoy! Grace Farms’ mission also includes Social Justice, “The Foundation’s Justice Initiative emerges from a commitment to protect and support some of the most vulnerable in society. By activating local and international organizations through programs at Grace Farms, the Justice Initiative fosters the development of comprehensive strategies and partnerships to disrupt and combat human trafficking and gender-based violence.” For example, social justice programs include on site workshops on human trafficking, in which the outcome report gets included and published on the United Nations University as part of The United Nations. Lastly, Grace Farms Foundation partners with 50 not-for-profit organizations and sponsors many experiences for those who are in need and vulnerable. When you are experiencing everything that Grace Farms has to offer the staff and volunteers always have a positive, kind, and welcoming attitude. Another very important initiative that they foster is Community. They welcome people of all ages and socioeconomic backgrounds. I will definitely be making a return trip.